1 Begin by getting your pan nice and hot over medium heat. Pour some oil and saute onions and garlic until soft. 2 Add ground pork and cook until pork turns light brown in color. 3 Add tomato sauce, evaporated milk, Knorr Pork Broth Cubes and dried basil. 4 Simmer until well incorporated. 5 Serve with spaghetti noodles and top with grated cheese. 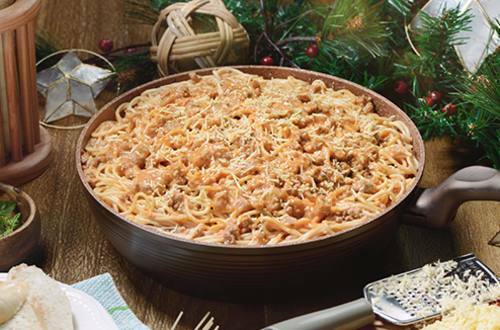 Receive hugs and kisses from your family when you serve Season's Special Tomato Spaghetti, it's delicious!